The Hotel is located at No. 163, Shiyuan Road, Beilin District (right opposite the Shaanxi Electric Power Corporation and at Jishiguai Bus Stop). The Hotel has full coverage of WIFI, a small meeting room accommodating about 30 people, non-smoking floor, and provide free parking space with limited number. The Hotel is accessible to foreigners, and its supporting Xinglianxin Cafe provides you with nutritious, rich, delicious and fast breakfast, lunch and supper. The Hotel is about 800m from Changlemen (also known as Dongmen) of Ming Dynasty City Wall, and there are many bus lines around the Hotel, allowing you to directly reach Xijing Hospital, Greater Wild Goose Pagoda, Datang Furong Garden, Provincial History Museum, Stone Tablets Museum, Huimin Street, Bell and Drum Towers and many other historical sites. Located in Bell Tower Business District and East Avenue Business District, the Hotel boasts convenient shopping. The route of reaching the Hotel through Xians major transportation junctions: 1. Take Bus Line 602 from Xi'an Railway Station for 15mins, get off at Jishiguai Stop, cross the road and walk eastward about 200 meters to reach the Hotel; 2. Take a taxi from Xi'an Xianyang International Airport for about 5 minutes to reach the Hotel, or take Airport Shuttle Bus to Jianguo Restaurant, take Bus Line 102, 701, 300, 8, 37 or 27 for about 10 minutes, get off at Xingqing Park North Gate Stop, and walk westward about 200 meters to reach the Hotel; 3. From Chengdong Passenger Station, take Metro Line 1 at Fangzhicheng Station to Tonghuamen Station, transfer to Bus Line 27 or 43 or K630 and get off at Jishiguai. 4. From Chengnan Passenger Station, take Bus Line K203 for about 35 minutes, get off at Jishiguai Stop, and walk eastward about 200 meters to reach the Hotel; 5. From Chengxi Passenger Station, take Bus Line 252, get off at Dongmen Stop, and walk eastward about 800 meters to reach the Hotel; 6. From Chengbei Passenger Station, take Bus Line 37, get off at Jishiguai Stop, and walk eastward about 150 meters to reach the Hotel. N reasons for guests of business, meeting and travel needs to love the Hotel: convenient transportation: there are over 30 bus lines within 200ms range of the Hotel, which facilitate your travel: Take Bus Line K203, K43, 300, K630, 37 and K8 etc. westward to Bell and Drum Towers and Hui People Street Snack Street; Walk westward for 5 minutes to Ming Dynasty City Wall, and visit the City Wall from the Dongmen; take Bus Line 704 and get off at Wenchangmen Stop, then you can reach the Stone Tablets Museum; Take Bus Line 27 to reach Greater Wild Goose Pagoda, Shaanxi History Museum and Datang Furong Garden, etc. Take Bus Line 306 (i.e. Tourist Line 5) at east square of Railway Station to the eighth wonder of the world Buried Sculpture Legion, Huaqing Hot Spring and Qin Imperator Mausoleum; Walk eastward 500 meters for about 5 minutes, then you can reach the Tang Dynasty Xingqing Palace Relics: rich resources --- rich commercial, recreational and catering resources; your different demands during business and travel trip can be met within 100ms rang around the Hotel. Shopping: Wanda Xintiandi, Wanda Shopping Plaza, Minsheng, Dongmen Parkson and Minleyuan NEW-MART; Supermarkets: Vanguard' s Supermarket, Renrenle and Wal-Mart; Entertainment: Wanda Cinema, China Film, Happy KTV, Dawanjia, Yijiayi Bar and UBC Coffee, etc. Banks: Bank of China, China Merchants Bank, Agricultural Bank of China, China Construction Bank and Industrial Bank Co, Ltd., etc. Delicacies: Xiangshuiyao, Shunfeng Beef, Beijing Roast Duck, Yangyeye Fondue Chinoise, Shuangliu Laoma Rabbit Head, Awei BBQ, Sanliutiao Handmade Noodle, Crisp Grass Carp Porridge and Hot Pot, KFC, and Xiaoliu Steamed Dumpling, etc. Business: Shaanxi Provincial Electric Power Company, Northwest China Grid, Dibiao Building, Shimao Building, Langfu Building, Zhaoshangju Square, Dongfang Xingzuo, Dongfang Xinyuan, Mingjue Building and many other office buildings are located here; Culture: Xi'an Jiaotong University, The Fourth Military Medical University, Xi'an No. 3 Middle School, Dongguan Primary School and other famous schools gather here; Comprehensive information of Xi'an Metro Lines: Xi'an Metro Line 1 Service Time: First Metro: starting from Houweizhai-6:05; starting from Fangzhicheng-6:05; Last Metro: starting from Houweizhai-23:00; starting from Fangzhicheng-23:00; Setting of Metro Stations: the entire line has 19 stations, which are: Houweizhai-Sanqiao-Zaohe River- Zaoyuan Garden-Hancheng Road-Kaiyuanmen-Laodong Road-Yuxiangmen-Sajin Bridge-North Street (transfer to Metro Line 2-Wulukou-Chaoyangmen-Kangfu Road-Tonghuamen-Wanshou Road-Changlepo-Chanhe River-Banpo-Fangzhicheng; Warm Reminder: the relevant landmarks and tourist attractions that can be reached by taking Xi'an Metro Line 1 with 19 stations: North Street: at this station, you can transfer to Metro Line 2, walk for about 10 minutes to reach Xi'an Bell Tower; Wulukou: this station is only 5mins walk from Xi'an Railway Station; Banpo: this station is only 10mins walk from Banpo History Museum. Xi'an Metro Line 2 Service Time: First Metro: starting from North Bus Station-6:00; starting from Conference and Exhibition Center -6:15; Last Metro: starting from North Bus Station -22:55; starting from Conference and Exhibition Center -23:10; Setting of Metro Stations: the entire line has 17 stations, which are: North Bus Station-Beiyuan- Sports Park-Administrative Center-Fifth Wufeng Road- Municipal Library - West Daming Palace- Longshouyuan- Anyuanmen-North Street (transfer to Metro Line 1) -Bell Tower-Yongningmen-Nanshaomen-Stadium-Xiaozhai-Weiyi Street-Conference and Exhibition Center; Warm Reminder: the relevant landmarks and tourist attractions that can be reached by taking Xi'an Metro Line 2 with 17 stations: North Bus Station: at this station, you can reach Xi'an North Bus Station (Xi'an HSR Station and Bullet Train Station); North Street: at this station, you can transfer to Xi'an Metro Line 1; Bell Tower: at this station, you can reach Xi'an Center, Bell and Drum Towers and Huimin Street; Xiaozhai: at this station, you can reach Xiaozhai, the prosperous business district in Xi'an; Conference and Exhibition Center: at this station, you can reach Xi'an International Conference and Exhibition Center. 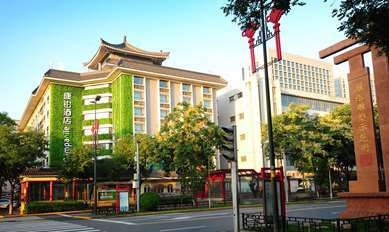 Jinjiang Inn Xi'an Dongmen is the best choice for your business and travel needs. Welcome to Jinjiang Inn Xi'an Dongmen! Small service items, umbrella, left luggage, map query, shower cap, shaver, hair dryer, laundry rack, iron and ironing board, safe box, patch board and reticle are available at reception desk.